Copying in examination has become very common these days. The 21st century, known as the age of science and technology, is the age of competition. Everybody wants to win, or become better than others. In every household, parents compel their children to secure first-position scores or do as good as they can in school or college. Many times, students resort to cheating to score high marks. But the question is, even if students do score higher marks by cheating, will that help them when they join the work force? How will they contribute to developing the nation? 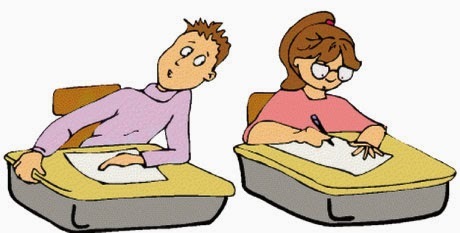 Students have adopted different ways to copy in examinations. They exchange their answer-sheets or consult answers for difficult questions with their friends. Many even work really hard to prepare chits with solutions to probable questions. Some try to persuade the invigilator with the hope that s/he may help them with the answers or give them the liberty to discuss with their friends. In the pretext of taking toilet break, students take time to read chits or other materials hidden in the toilets or in their bodies. It has also been reported in many newspapers that in some examination centers in rural areas of Nepal, examinees throw question paper out of the window and their friends/relatives waiting outside the exam hall solve the questions and resend them to the examinees. To address this problem, this defective system of education should be checked. To begin with, parents and teachers should stop pressurizing students to focus on their scores. This unnecessary psychological pressure often mentally tortures students. Rather, focus should be shifted to encouraging learning. Another measure to be adopted is to follow the vocational system of education. This system emphasizes on the practical approach to learning. Also, those who are caught copying or helping students in the examination hall should be punished. Last but not the least, I think the ratio of students and the invigilators in the exam hall should match. I hope, if these measures are adopted, wheat can be sorted out from the chaff to some extent. Sujan is a Class IX student at Siddhartha Vanasthali Institute in Kathmandu.